The Grand Match That Never Was Do we have a village star in the making? The Ryder Cup - Did you know? 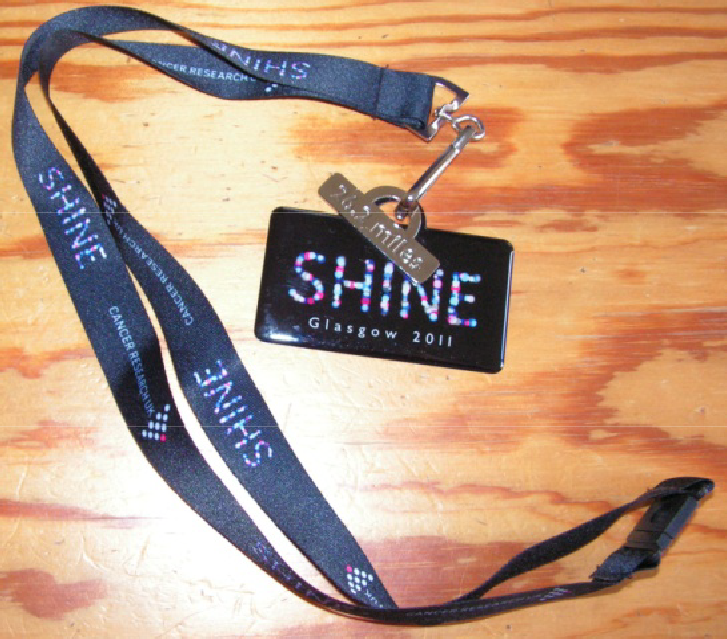 The Shine Marathon walk for Cancer Research took place on the 10th September at the SECC in Glasgow. Catherine MacDonald of Brandywell Road is no stranger to long charity walks. She has previously completed three Moonwalks and a Race for Life10k at Holyrood Park. When she saw the Shine walk advertised she bravely decided to go by herself. She has previously raised money for Breast cancer charities but this time she decided to nominate research into testicular cancer as her charity. The walk began at 9.30pm and Catherine soon found friends among the 3000 participants to walk with. It was a long, hard walk, particularly in the wee sma’ hours, but she kept going and was proud to be presented with her medal at her successful finish. She was a bit stiff but felt great satisfaction at doing her best time ever for the 26.2 miles and she raised £325 for a good cause.